Posted by Nish on Sunday, June 1st, 2014. 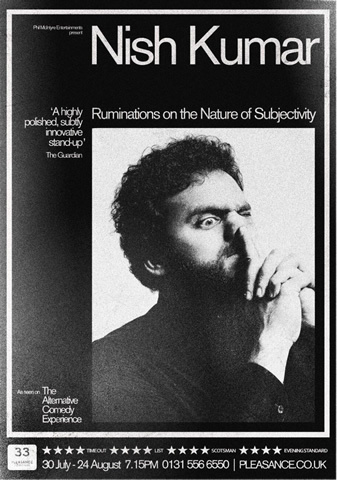 Tickets are available for my brand new show “Ruminations on the Nature of Subjectivity”. Yes it is a stupid title. The show is coming together as we speak and, I don’t want to jinx this, may not be a total disaster this year. Optimism thy name is Kumar. 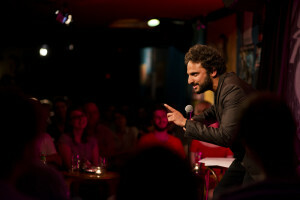 Last summer I filmed some stand up for this show and it is going to air in July. As you can imagine, I was flattered and somewhat baffled to be asked to do the show, given the calibre of the rest of the people involved. “But Nish” I hear you, dear internet, cry, “surely this false modesty?” Incorrect my friend, the other people include David O’Doherty, Bridget Christie, Tony Law, Josie Long, Isy Suttie and more people who I am empirically worse than at comedy. “Oh Nish. You were absolutely right, you should be thanking your lucky stars they put you on that” I hear you correct yourself. It was a really fun gig and everybody involved was incredibly nice and supportive. You should definitely watch it as it will be brilliant. “Comedy Central’s critically acclaimed cult stand-up series, The Alternative Comedy Experience, is returning this July with 13 brand new episodes, featuring a host of fresh and established acts from the ever popular stand up circuit, curated once again by Stewart Lee. The Alternative Comedy Experience takes an entirely original look at the celebrated, grass-roots stand-up scene, going both in front of and behind the curtain to see performances from some of the best cult comedy acts around, unlike any other live stand-up show on our screens. The range of comedy talent appearing in the second series reflects an ever-changing scene, including a significant number of female comedians, making up almost half the bill, making it one of the most female friendly stand-up shows ever made. Returning for series two are favourites Bridget Christie, Tony Law, Isy Suttie, David Kay, Simon Munnery, Maeve Higgins, Josie Long, David O Doherty, Paul Foot and Henning Wehn and many others alongside new names such as Kevin Eldon, Michael Legge, Helen Arney, Ginger & Black, Nish Kumar, Helen Keen, Liam Mullone, Grainne MaGuire, Susan Calman and John Hegley. Once again the acts are curated by the inimitable comedian Stewart Lee and Comedy Central. Together they have selected an array of diverse, interesting and innovative comedians to create a fast-moving, distinctive show, guaranteed to be unpredictable, original and hilarious in equal measure. A mix of award-winning acts share the stage alongside a buffet of breakthrough talent, some of whom are making their first ever appearance on a TV stand up show. 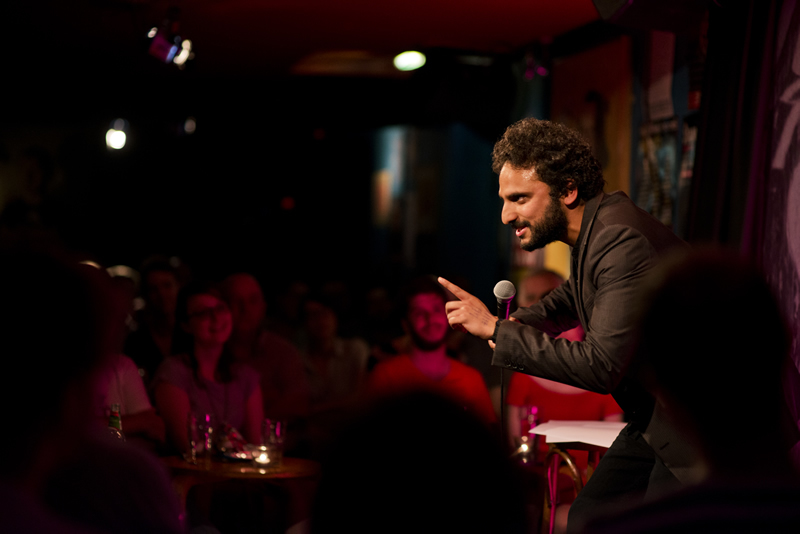 Filmed at Edinburgh’s iconic The Stand Comedy Club in front of a live audience of paying punters, The Alternative Comedy Experience follows the same popular format as the original season, which sees short clips of each act stripped across the series.